Recently on the Dr. Drew Show, where the theme revolved around “transgenders” with James White as a guest, Dr. Drew began the show with a clip of Steven Anderson ranting about Bruce Jenner, praying that Jenner would die and go to hell. Of course, it’s not uncommon for liberal media personalities to use the most extreme examples of professing Christians to provoke an emotionally charged irrational response against the conservative Christian crowds that raise the most objections to issues such as homosexuality and transgenderism. Although, Dr Drew didn’t use Anderson any differently than James White uses Anderson to portray King James Only advocates. Let us first say on behalf of all independent fundamental Baptists (IFB) of all stripes, that NONE of us recognize Steven Anderson as a bona fide fundamental Baptist. He has virtually nothing in common with any IFB denomination, and has been openly hostile of every IFB minister and ministry from Peter Ruckman, Bob Gray Sr., David Cloud, D.A. Waite, Jack Moorman, Phil Stringer, Jack Chick, to Fellowship Tract League, William Grady, Sam Gipp, Lester Roloff et al , and that’s just about every known “leader” so-to-speak in modern fundamental “circles”. The above names have sharp disagreements with each other, but Anderson hates them ALL. Anderson is an anti-Semitic, hermeneutically challenged anomaly that in our opinion at DRC is on someone’s payroll to make Baptists look like complete idiots (above and beyond some of the dumb things we’ve done amongst ourselves). In fact, not only do we deny that Anderson is IFB but have a standing joke that Anderson is actually a closet Calvinist. But, to save the day on the Drew show, James White of Alpha & Omega Ministries gives the Christian side of the transgender debate. Frankly, White did a fairly good job at keeping the topic on topic in light of the red herrings and strawmen being thrown at him from the stage (including an unnecessary pejorative jab by Dr. Drew, “That’s what the Duggars told their son” when White stated we need to listen to what God says about His creation), and given the hand he was dealt against the clearly stacked deck held by the house, he actually did manage to accurately describe the Christian perspective of God’s design and purpose for the male and female to a hostile crowd. I think he could have been a little more thorough, but in fairness, he probably got more chances to offer what he DID get to explain than the producers wanted to give him. White made it quite clear that Steven Anderson’s brand of Christianity is not reflective of genuine orthodoxy. We agree, but this is where we have a contention with Calvinism. We don’t think honest Calvinists can be consistent with their theology when condemning people like Steven Anderson because their theology maintains the exact same sentiment. Here’s a simple question we asked Calvinists on Twitter: Did Christ die for Bruce Jenner? Not one single Calvinist tried to answer that. White also made a near 2 hour video on John 3:16 in 2006 attempting to show that God doesn’t love everybody. John Calvin wrote, “It is incontestable that Christ came for the expiation of the sins of the whole world.” Calvin, Concerning the Eternal Predestination of God p.148. R.C. Sproul stated that, “The world for whom Christ died cannot mean the entire human family. It must refer to the universality of the elect”. Sproul, Chosen By God, pp 206-207. There are not very many exceptions in Calvinism when it comes to the question of God’s love for all. Those who doattempt to make an exception (such as John MacArthur, “Does God Love Whom He Does Not Save?”) merely attempt to move the goal posts a little down the field by deferring to a different kind of love for the sinner than for the elect, but the outcome is still the same, God didn’t love the unelect enough to keep them out of hell so not even MacArthur can claim his views are any different than his compadres. (We’ve addressed the issue of different kinds of love, and Calvinists usage of “rain on the just and unjust” argument here). Not only do most Calvinists concede that God does not love everyone, but the remaining consensus among them is that if He does not love everyone, and didn’t elect you, then He hates you! James White writes about Romans 9:13, “No matter how one understands ‘Jacob have I love but Esau have I hated’ , this verse alone should be enough to refute such an errant view of God’s love.” Debating Calvinism, p.268 (emphasis added). Notice that White contrasts “hate” verses any opposing view as being an “errant view” that God would love all. James White also denies being a hyper-Calvinist (a denial that is defended by Phil Johnson), so this view can’t be blamed on “hyper Calvinism” (although we vehemently deny that there is any such thing. The eventual results of infra-,supra- or sub lapsarianism and their various modifications are all inconsistent and lead to exhaustive determinism and fatalism). Paul Washer says that, ” ‘God hates the sin but loves the sinner’ looks good on the back of a t-shirt, but that’s not Biblical”. In fact, Washer even offers an erroneous interpretation of Psalm 5 as a contrast to the universal love taught in John 3:16. John Piper dittoes this sentiment in “God loves the Sinner But Hates the Sin? July 30, 2013. Now what Calvinists will normally do at this point after you’ve proven point after point, with quote after quote (and I do have many many more) of just what their trusted leaders have affirmed on these issues, is attempt to justify their position while ignoring the fact that just 5 minutes ago they were denying that any Calvinist ever held to these views. Calvinists have no grounds on which to condemn Steven Anderson’s view of Bruce Jenner. Calvinists have no grounds on which to condemn Steven Anderson’s view of Bruce Jenner. Calvinists have always freely condemned any person that does not bear the fruit of the Spirit as a person who is either unsaved or was never saved in the first place (which is still unsaved). In fact, White and JD Hall have said such about Ergun Caner and Peter Lumpkins and several other ministers in the SBC, and White has even hinted that anyone who rejects Calvinism is not a Christian (and Hall blatantly said so). Certainly if they can reserve that judgment on professing Christians, is there any doubt what the Calvinist view of Bruce Jenner is? White has confirmed on more than one occasion that homosexuality is a gospel issue (and we agree, though for different reasons which we’ve addressed in Westboro Baptist Calvinists). Thus the only alternative is that Bruce Jenner is clearly not one of the elect, and not predestinated for salvation, but is in fact, non elect. Since Bruce Jenner isn’t elect, then God hates him. That’s the only consistent position a Calvinist can take on this matter. They can’t claim “Well we don’t know” because they’ve certainly said they DID know about many others who were/are professing Christians (White has even claimed that *I* am unsaved) . Therefore, there is no meaningful difference from the Calvinist theological position that God hates Bruce Jenner and has predestined him for hell, and Steven Anderson’s comments that he hates Bruce Jenner, and hopes he goes to hell. At least Anderson is honest about his views as wrong as they are. The views of Steven Anderson and the views of Calvinism as a whole are exactly the same when it comes to people like Bruce Jenner. In both views God hates the sinner and wants them to burn in hell. If there is a difference, it would merely be that God, according to Calvinism, reprobated Jenner before time, and Anderson is praying for God to hasten His judgment for it in time. Calvinism continues to maintain its credibility by being consistently rhetorically dishonest about what they believe. See also Leighton Flowers, Did God Determine Homosexuality? For additional thoughts on how consistent Calvinism would actually blame God for Bruce Jenner’s condition. 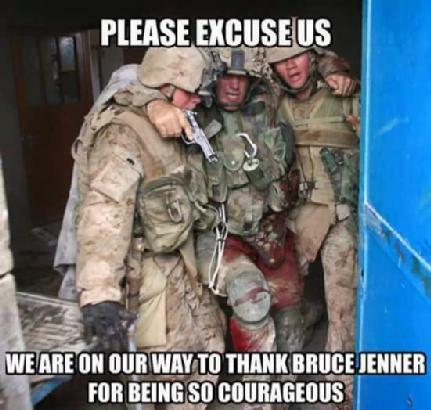 Although Leighton did not specifically mention Jenner, one can use the same logic that Leighton used and simply replace the terms “homosexual” with “transgender”. This comment will make more sense to you after you read his article.